"My plea therefore is this: Let us get our instruments tightly strung and our melodies sweetly sung. 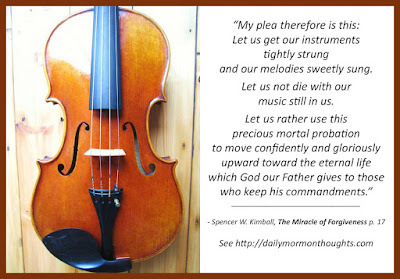 Let us not die with our music still in us. Let us rather use this precious mortal probation to move confidently and gloriously upward toward the eternal life which God our Father gives to those who keep his commandments." 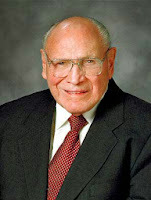 President Kimball wrote his landmark book The Miracle of Forgiveness to help invite and encourage all to receive the blessings of repentance in their lives. This excerpt comes at the end of the introduction to the book, as he sets the stage for the joy and blessing that come as we accept the invitation to repent and be forgiven. It's in the spirit of Amulek's urgent plea to both his listeners and future readers to "not procrastinate the day of your repentance" (Alma 34:33). What a sweet and hopeful expression! We all have beautiful melodies inside us, that we need to allow to flow out freely and bring joy both to us and those around us. We should not let anything hold us back from living life to the fullest! We need to move "confidently and gloriously upward" with God's help; as we obey and allow His blessings into our life, we will find that wonderful opportunity to live in joy, with the sweet melodies of life flowing freely. "This instruction applies to all who follow Him. We are commanded to seek out those who are lost. We are to be our brother’s keeper. We cannot neglect this commission given by our Savior. We must be concerned for the one. "Today I would like to talk about those who are lost—some because they are different, some because they are weary, and some because they have strayed. "Some are lost because they are different. They feel as though they don’t belong. Perhaps because they are different, they find themselves slipping away from the flock. They may look, act, think, and speak differently than those around them and that sometimes causes them to assume they don’t fit in. They conclude that they are not needed. "Tied to this misconception is the erroneous belief that all members of the Church should look, talk, and be alike. 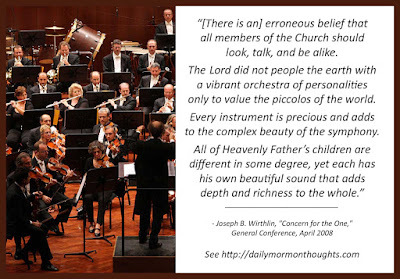 The Lord did not people the earth with a vibrant orchestra of personalities only to value the piccolos of the world. Every instrument is precious and adds to the complex beauty of the symphony. 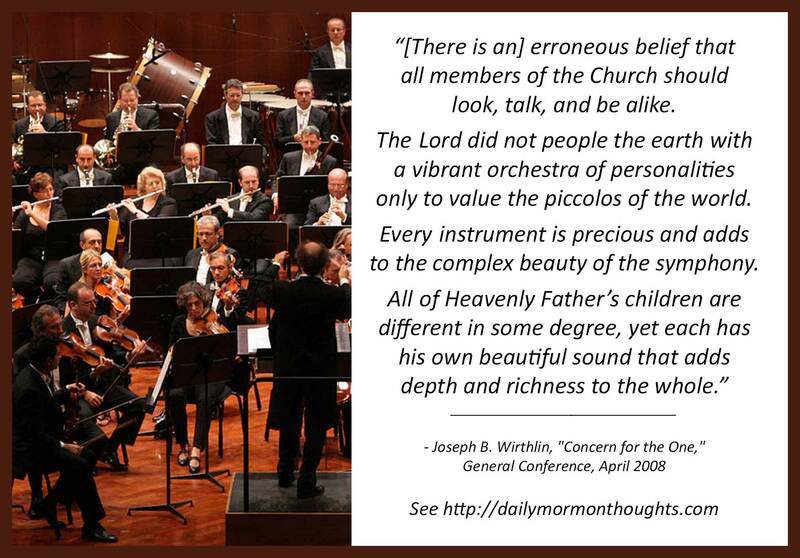 All of Heavenly Father’s children are different in some degree, yet each has his own beautiful sound that adds depth and richness to the whole. "This variety of creation itself is a testament of how the Lord values all His children. He does not esteem one flesh above another, but He 'inviteth them all to come unto him and partake of his goodness; and he denieth none that come unto him, black and white, bond and free, male and female; … all are alike unto God' (2 Nephi 26:33)." 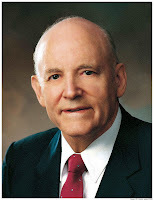 I loved this talk by Elder Wirthlin. It expressed such caring and sympathy for each individual. He recognized the Savior's example in giving personal attention to "the one," and our responsibility as His disciples to do likewise. Then he identified specific examples of individuals who sometimes need particular love and care. The one who is different from the normal Church member in some way was foremost on his list. We are each different from others, but sometimes those differences are more pronounced and noticeable; those are the cases where we need to show an increase of love and acceptance. We often feel more comfortable surrounding ourselves with those who are most like us. But truly, as we discover the blessing of difference, we recognize both the opportunity to serve those in need, but also the personal growth that comes as we are blessed by the things we learn from those who are different. Labels: care for one, charity, Wirthlin Joseph B. "This scripture means that we express thankfulness for what happens, not only for the good things in life but also for the opposition and challenges of life that add to our experience and faith. We put our lives in His hands, realizing that all that transpires will be for our experience. "When in prayer we say, 'Thy will be done,' we are really expressing faith and gratitude and acknowledging that we will accept whatever happens in our lives. 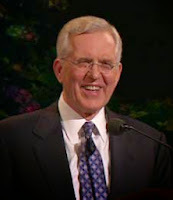 "That we may feel true gratitude for the goodness of God for all the blessings that have been given to us and express those feelings of thankfulness in prayer to our Heavenly Father is my prayer." That's a remarkable attitude to develop, the depth of faith and confidence that allows us to truly trust in Him in all things. Our tendency, through our limited, short-sighted understanding, is to forget that God's hand is in all things. That's a powerful lesson to remember! Elder Dallin H. Oaks (born August 12, 1932) served as president of BYU from 1971-1980. 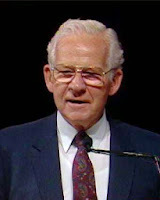 He was then appointed as a justice of the Utah Supreme Court, and resigned when he was called to the Quorum of Twelve Apostles in 1984. "When we try to develop faith in the Lord Jesus Christ rather than merely cultivating faith as an abstract principle of power, we understand the meaning of the Savior’s words: 'If ye will have faith in me ye shall have power to do whatsoever thing is expedient in me' (Moro. 7:33). "Similarly, the Savior taught the Nephites that they must always pray to the Father in his name, adding: 'And whatsoever ye shall ask the Father in my name, which is right, believing that ye shall receive, behold it shall be given unto you' (3 Ne. 18:20). "Here the Savior reminds us that faith, no matter how strong it is, cannot produce a result contrary to the will of him whose power it is. The exercise of faith in the Lord Jesus Christ is always subject to the order of heaven, to the goodness and will and wisdom and timing of the Lord. 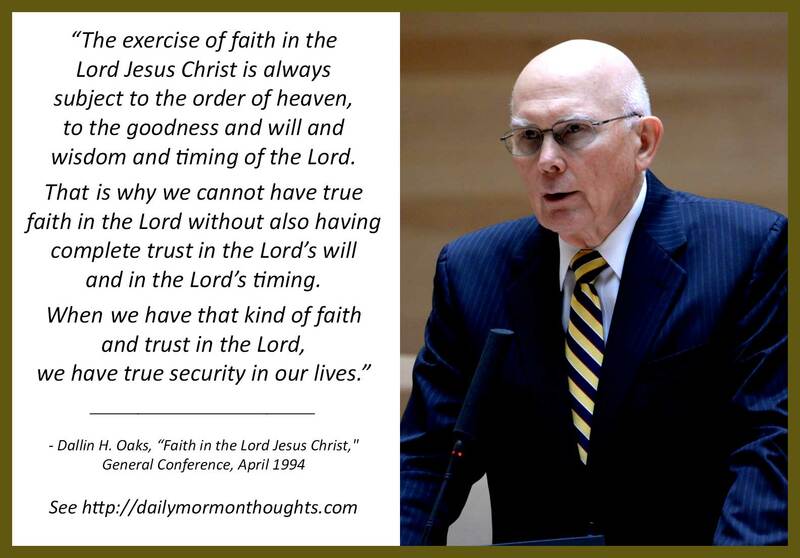 That is why we cannot have true faith in the Lord without also having complete trust in the Lord’s will and in the Lord’s timing. When we have that kind of faith and trust in the Lord, we have true security in our lives. 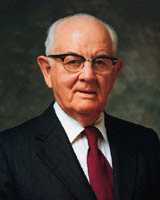 President Spencer W. Kimball said, 'Security is not born of inexhaustible wealth but of unquenchable faith' (TSWK 72–73)." Having faith also requires having trust—in the Lord's timing, and in His "goodness and will and wisdom" that He will always do what is right and best for us. No faith can bend His will. Having true faith in Him brings ultimate confidence and security, so that come what may, we will be prepared to confront and carry on. What a priceless gift! 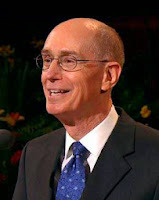 "It has always been hard to recognize in fallible human beings the authorized servants of God. Paul must have seemed an ordinary man to many. Joseph Smith’s cheerful disposition was seen by some as not fitting their expectations for a prophet of God. "The warning for us is plain. If we look for human frailty in humans, we will always find it. When we focus on finding the frailties of those who hold priesthood keys, we run risks for ourselves. When we speak or write to others of such frailties, we put them at risk. 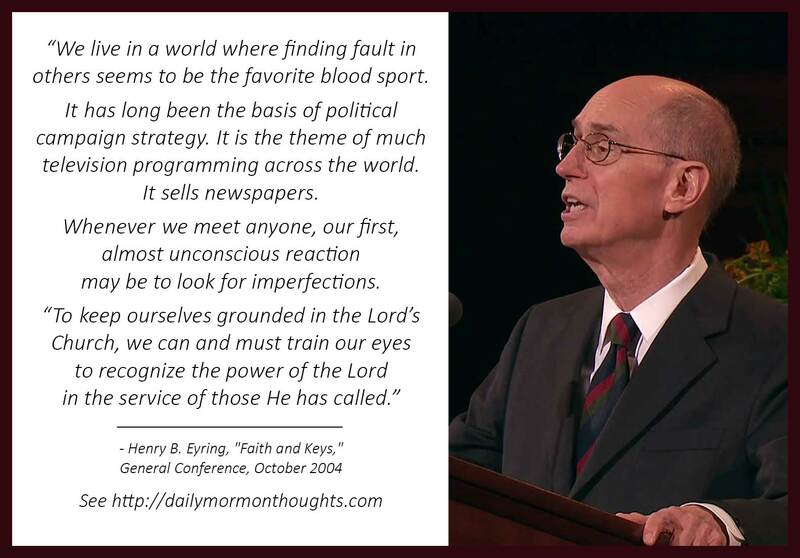 "We live in a world where finding fault in others seems to be the favorite blood sport. It has long been the basis of political campaign strategy. It is the theme of much television programming across the world. It sells newspapers. Whenever we meet anyone, our first, almost unconscious reaction may be to look for imperfections. "To keep ourselves grounded in the Lord’s Church, we can and must train our eyes to recognize the power of the Lord in the service of those He has called. We must be worthy of the companionship of the Holy Ghost. And we need to pray for the Holy Ghost to help us know that men who lead us hold this power. For me, such prayers are most often answered when I am fully engaged in the Lord’s service myself." Can imperfect people still be instruments in the hands of God? Do "fallible human beings" have callings to serve, even in significant leadership roles? The answer is most certainly yes. But as President Eyring points out, the Adversary uses this fact to undermine our faith in the Lord's Church and its leadership as we sometimes see "the humanity" of those who hold priesthood keys. The critical skill we must develop is the ability to distinguish between the person and the position. God has only imperfect men and women to work with and through in this life; we all fall short in some way. But in spite of that, He is able to use whatever efforts we offer Him to bring to pass much good. In spite of the mud-slinging tendency of the world, we must never forget that a perfect God may still work His perfect plan using imperfect people. So it's critical for us to learn to look for the signs of God's power being manifest, regardless of who currently and temporarily holds the keys to direct the work. It is our responsibility to be worthy of the Holy Ghost, who will help us to see God's hand in the actions of others. 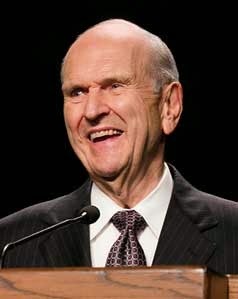 President Russell M. Nelson (born Sept 9, 1924) was an internationally-renowned heart surgeon when he was called to serve as a member of the Quorum of Twelve Apostles in 1984. He was set apart as president of the Quorum of Twelve on July 15, 2015. "Life does not begin with birth, nor does it end with death. Prior to our birth, we dwelled as spirit children with our Father in Heaven. There we eagerly anticipated the possibility of coming to earth and obtaining a physical body. Knowingly we wanted the risks of mortality, which would allow the exercise of agency and accountability. 'This life [was to become] a probationary state; a time to prepare to meet God.' (Alma 12:24.) But we regarded the returning home as the best part of that long-awaited trip, just as we do now. Before embarking on any journey, we like to have some assurance of a round-trip ticket. 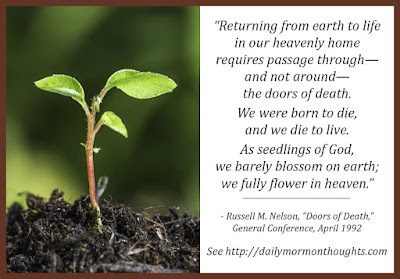 Returning from earth to life in our heavenly home requires passage through—and not around—the doors of death. We were born to die, and we die to live. (See 2 Cor. 6:9.) As seedlings of God, we barely blossom on earth; we fully flower in heaven." Everything changes in our interpretation of events and circumstances when we maintain a greater perspective, one that includes both the pre-mortal and post-mortal phases. Neglecting to maintain that view of the entire scope can make many of the challenging events of life overwhelming. In this discussion of death as a part of the eternal plan of our Heavenly Father, President Nelson helps us remember that greater perspective. 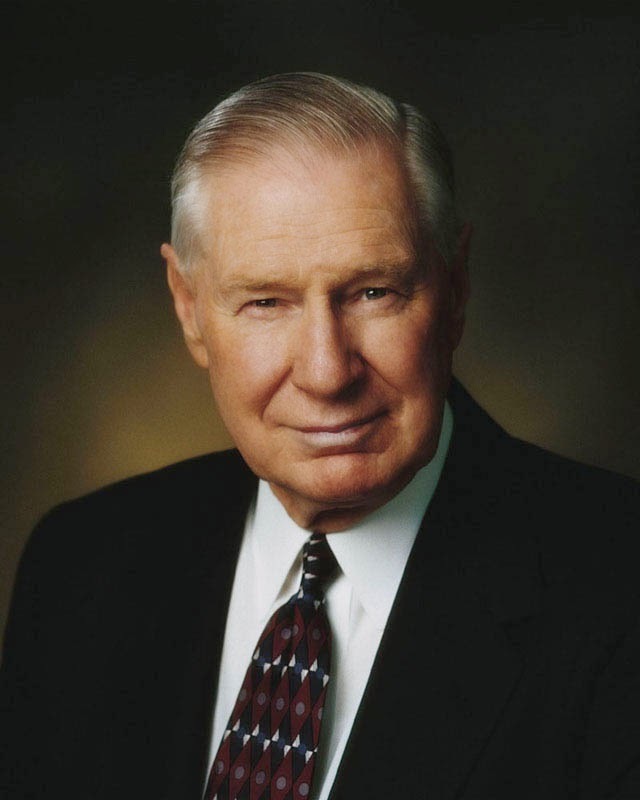 In the distant past, when we were still anticipating our mortal experience, President Nelson notes that we would have maintained that complete, eternal view of the experience, and would have known that "returning home [was] the best part of that long-awaited trip." When we view death in that way, it changes everything! Adding this perspective of the continuing progress (the "blossoming") to come in the next life helps us treat death with gratitude and anticipation. "God the Eternal Father did not give that first great commandment because He needs us to love Him. His power and glory are not diminished should we disregard, deny, or even defile His name. His influence and dominion extend through time and space independent of our acceptance, approval, or admiration. 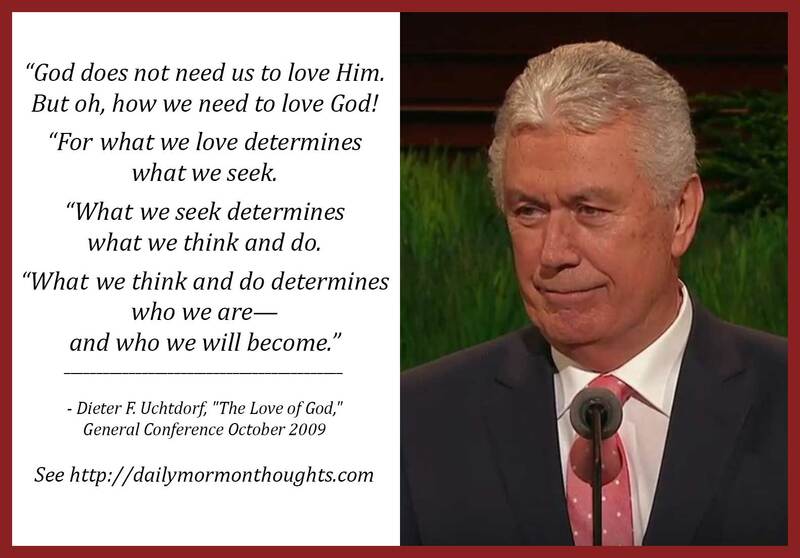 "No, God does not need us to love Him. But oh, how we need to love God! "For what we love determines what we seek. "What we seek determines what we think and do. "What we think and do determines who we are—and who we will become. "We are created in the image of our heavenly parents; we are God’s spirit children. Therefore, we have a vast capacity for love—it is part of our spiritual heritage. What and how we love not only defines us as individuals; it also defines us as a church. Love is the defining characteristic of a disciple of Christ. "Since the beginning of time, love has been the source of both the highest bliss and the heaviest burdens. At the heart of misery from the days of Adam until today, you will find the love of wrong things. And at the heart of joy, you will find the love of good things. "And the greatest of all good things is God." The things we love have a significant impact on our lives; they help determine priorities, thoughts, and actions. When we love God above all else, it impacts our lives in profound ways. 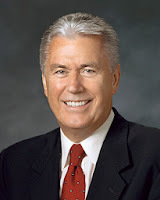 President Uchtdorf then summarizes in defining love as the heart of joy and the source of bliss in our lives. Truly, "Love is the defining characteristic of a disciple of Christ" and should be one of our great quests in this life. 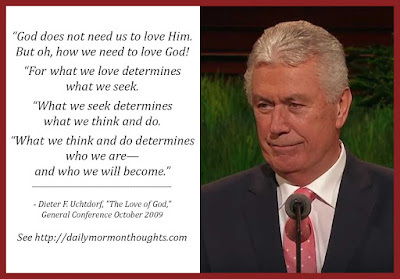 Labels: charity, God, love, Uchtdorf Dieter F.
"We can lift ourselves, and others as well, when we refuse to remain in the realm of negative thought and cultivate within our hearts an attitude of gratitude. If ingratitude be numbered among the serious sins, then gratitude takes its place among the noblest of virtues." 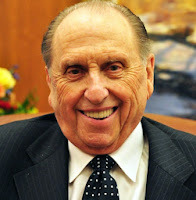 President Monson has always been the consummate optimist. This is one of the keys to his attitude: "While there are some things wrong in the world today, there are many things right...." He seems always able to identify the blessings, the positive things that happen around us. It's a great characteristic to develop. This is a good list to start with; we might each consider our level of gratitude in those areas, and then look for additional areas that might be personally applicable. 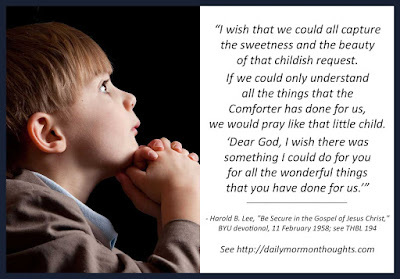 "I wish that we could all capture the sweetness and the beauty of that childish request. If we could only understand all the things that the Comforter has done for us, we would pray like that little child. 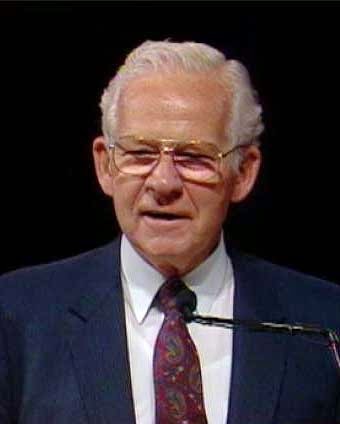 'Dear God, I wish there was something I could do for you for all the wonderful things that you have done for us.'" Often children amaze us with the simplicity and purity of their faith. President Lee shares one such example. The young boy he describes must have learned from the language of his parents, that in spite of trials and challenges, there is much to be grateful for. Of course, the only thing God asks us to do for Him in return for the blessings we receive is to love Him in return, to live faithfully by His word, and to spread His light to those around us. "How does God feel about appreciation? From the Doctrine and Covenants I share this: 'And in nothing doth man offend God, or against none is his wrath kindled, save those who confess not his hand in all things, and obey not his commandments' (D&C 59:21). "May I conclude by saying, 'When thou risest in the morning let thy heart be full of thanks unto God' (Alma 37:37). This is a choice, all-inclusive quotation from Alma." "Appreciation... is God’s way of helping us to grow." That's a great statement! We more commonly think that we grow through trials, or through learning, or through service. 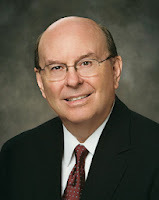 Elder Ashton claims that the truly grateful heart is one that is progressing and developing. And that "the ultimate in maturity" is the ability to "feel and express appreciation." The Doctrine and Covenants passage that tells how ingratitude offends and angers God puzzled me for a long time. It seemed to say, as Elder Ashton suggests, that God needs our praise and recognition for His own personal reasons. But instead, I think that He knows how much we need to express those feelings for our benefit, not His. "Our growth and our progress are delayed when we fail to feel and express appreciation." So it's the process of showing appreciation, along with expressing it, that is key. 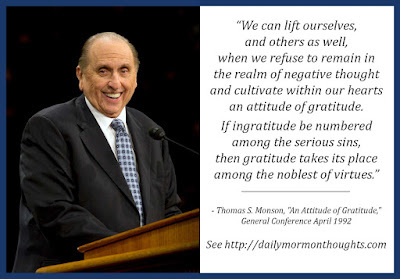 We do, indeed, want to have our hearts "full of thanks unto God" at all times; we will demonstrate that gratitude "By our lives, by our works, and by our words, and through a willingness to confess his hand in this and in all other great gifts." 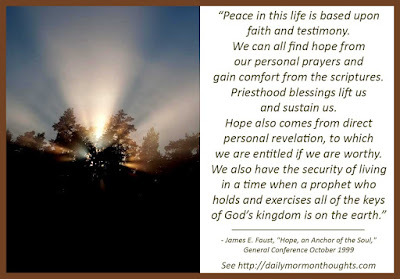 "Peace in this life is based upon faith and testimony. We can all find hope from our personal prayers and gain comfort from the scriptures. 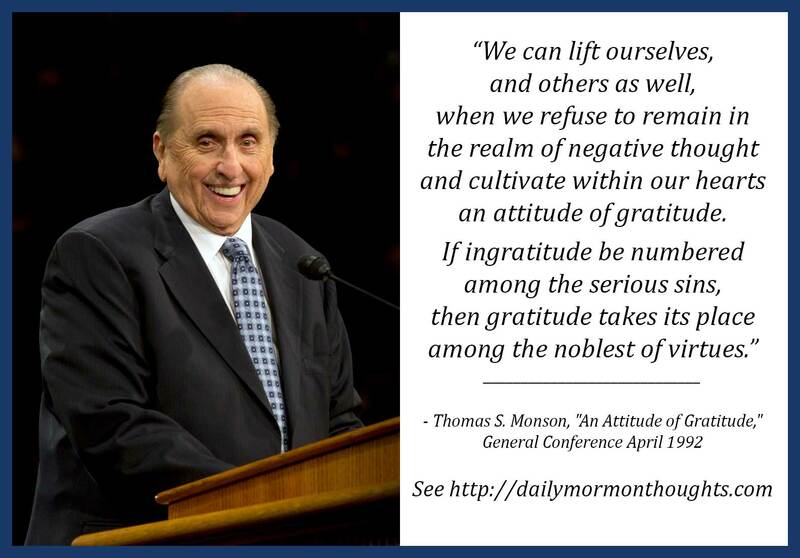 Priesthood blessings lift us and sustain us. Hope also comes from direct personal revelation, to which we are entitled if we are worthy. We also have the security of living in a time when a prophet who holds and exercises all of the keys of God’s kingdom is on the earth." The world's definition of "hope" is generally as a vague and ungrounded emotion, a wistful desire. But the gospel's definition is based on firm understanding and well-grounded expectation for future blessings—a "trust in God's promises" and confidence that all will be well in His hands. President Faust describes the "challenges and difficulties" of our mortal life, and reassures us that through faith and hope, we can find peace even when we don't fully understand the reasons. Finding hope in times of challenge and trial is a critical skill to develop. 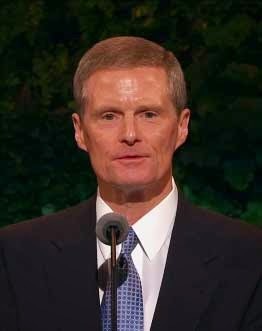 President Faust reminds us of some of the sources: prayer, scriptures, priesthood blessings, personal revelation, and prophetic counsel. In "times of plenty" we should be taking advantage of those sources in order to fortify our faith and hope for the times of need. "All of us live in the world. Of course we do. We cannot live a cloistered existence. But we can live in the world without partaking of the unseemly ways of the world. "The pull gets ever stronger. The adversary is clever and subtle. He speaks in a seductive voice of fascinating and attractive things. We cannot afford to let down our guard. We cannot afford to drop the ball. We need not run the wrong way. The right way is simple. 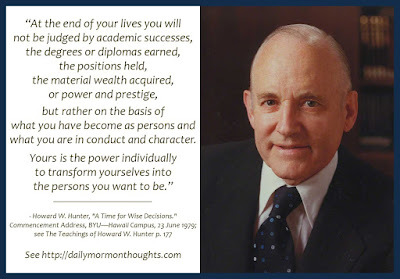 It means following the program of the Church, bringing into our lives the principles of the gospel, and never losing sight of what is expected of us as sons [and daughters] of God with a great inheritance and a marvelous and eternal potential. 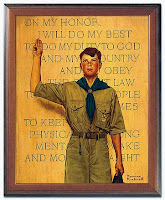 "Simple and tremendously challenging are the words of the Scout Oath: 'On my honor I will do my best.' If every one of us would make that effort, the world would be much better, and we would be much happier. It is so often the very small and singularly inconsequential acts of our lives that eventually make so great a difference." 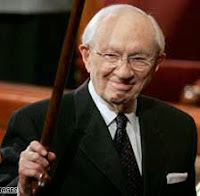 President Hinckley finds wisdom in the simple words that begin the Scout Oath: "On my honor, I will do my best." In today's society we need more people whose honor means something, whose promises and oaths can be trusted, and who are willing to always strive to simply do their best at all times. That would truly make the world, and each of us individually, a much happier place. 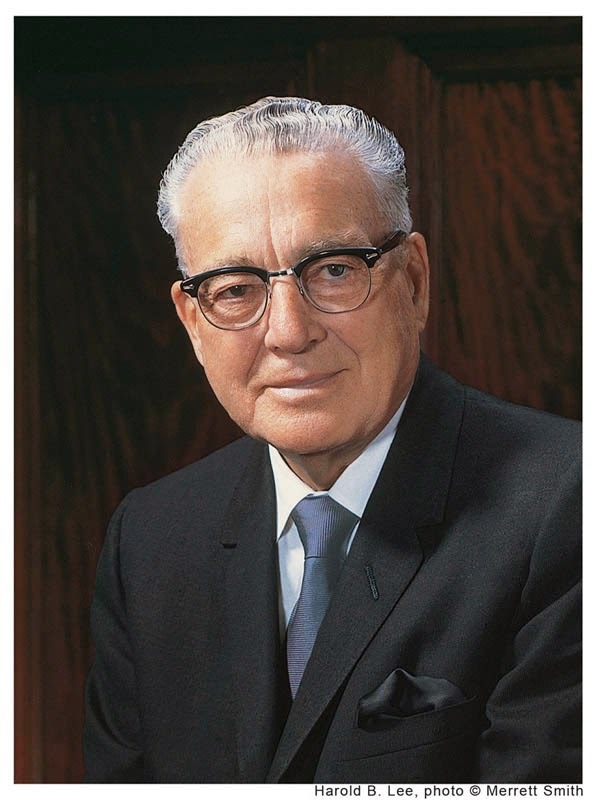 As President Hinckley notes, the small and seemingly "inconsequential acts" can have powerful results. "I would offer you this advice in your own study: Be patient, don’t be superficial, and don’t ignore the Spirit. "Finally, don’t neglect the Spirit. 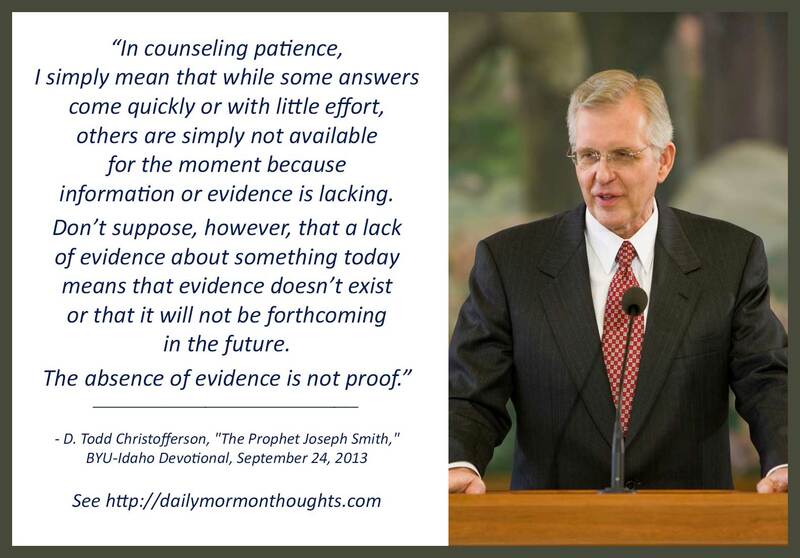 As regards Joseph Smith, we seek learning both by study and by faith. (See D&C 88:118.) Both are fruitful paths of inquiry. A complete understanding can never be attained by scholarly research alone, especially since much of what is needed is either lost or never existed. There is no benefit in imposing artificial limits on ourselves that cut off the light of Christ and the revelations of the Holy Spirit. Remember, 'By the power of the Holy Ghost, ye may know the truth of all things.' (Moroni 10:5.)" Perhaps the most important skill is learning to be guided by the Holy Spirit as we strive to learn and understand. According to Nephi, the Holy Ghost "will show unto you all things what ye should do" (2 Nephi 32:5). What a precious promise! "How we treat those closest to us is of fundamental importance. Violence, abuse, lack of civility, and disrespect in the home are not acceptable—not acceptable for adults and not acceptable for the rising generation. 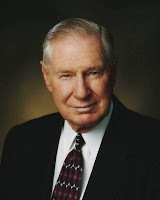 My father was not active in the Church but was a remarkably good example, especially in his treatment of my mother. He used to say, 'God will hold men responsible for every tear they cause their wives to shed.' This same concept is emphasized in 'The Family: A Proclamation to the World.' It reads, '[Those] who abuse spouse or offspring … will one day stand accountable before God.' Regardless of the culture in which we are raised, and whether our parents did or did not abuse us, we must not physically, emotionally, or verbally abuse anyone else. "The need for civility in society has never been more important. 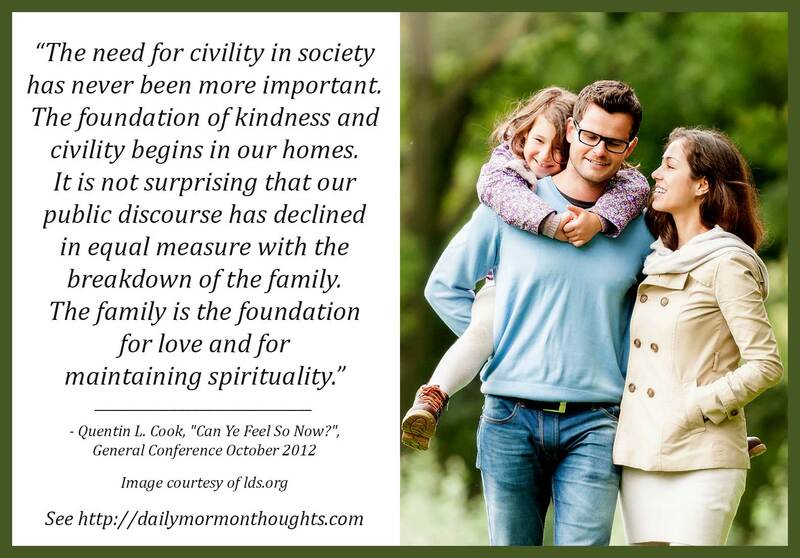 The foundation of kindness and civility begins in our homes. It is not surprising that our public discourse has declined in equal measure with the breakdown of the family. The family is the foundation for love and for maintaining spirituality. The family promotes an atmosphere where religious observance can flourish. There is indeed 'beauty all around when there’s love at home' (“Love at Home,” Hymns, no. 294)." The prophetic foresight in the Family Proclamation, issued in 1995, is astonishing as we see the moral decline that has occurred since then. 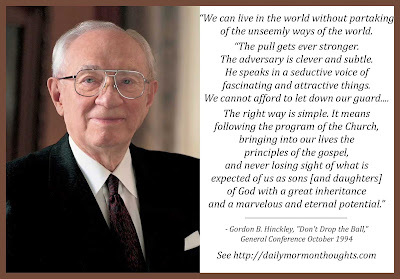 It is so critical for us to know those principles and cling to them! 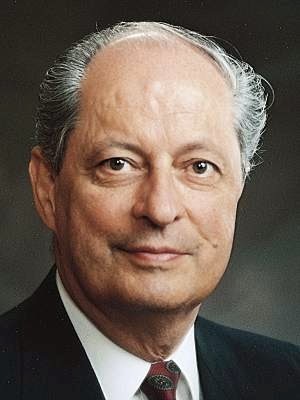 "And after we come out of the waters of baptism, our souls need to be continuously immersed in and saturated with the truth and the light of the Savior’s gospel. Sporadic and shallow dipping in the doctrine of Christ and partial participation in His restored Church cannot produce the spiritual transformation that enables us to walk in a newness of life. 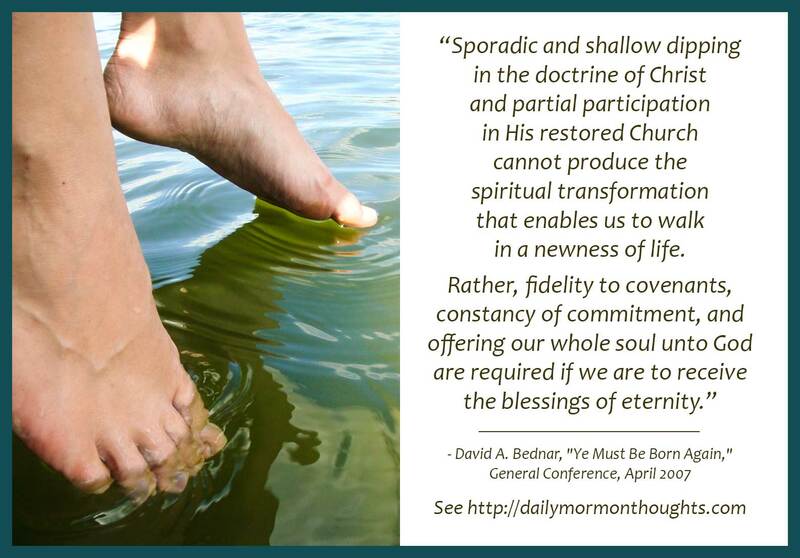 Rather, fidelity to covenants, constancy of commitment, and offering our whole soul unto God are required if we are to receive the blessings of eternity. "'I would that ye should come unto Christ, who is the Holy One of Israel, and partake of his salvation, and the power of his redemption. Yea, come unto him, and offer your whole souls as an offering unto him, and continue in fasting and praying, and endure to the end; and as the Lord liveth ye will be saved' (Omni 1:26). "Total immersion in and saturation with the Savior’s gospel are essential steps in the process of being born again." I've always appreciated Omni's description too, that we must offer our whole souls to God; a partial offering or a partial commitment just won't bring the redemption and salvation that we seek. 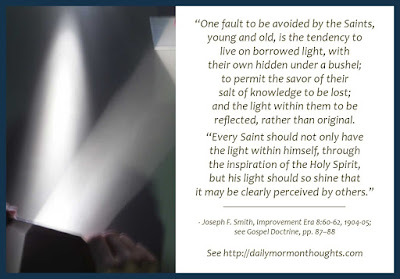 “One fault to be avoided by the Saints, young and old, is the tendency to live on borrowed light, with their own hidden under a bushel; to permit the savor of their salt of knowledge to be lost; and the light within them to be reflected, rather than original. "Every Saint should not only have the light within himself, through the inspiration of the Holy Spirit, but his light should so shine that it may be clearly perceived by others. “Men and women should become settled in the truth, and founded in the knowledge of the gospel, depending upon no person for borrowed or reflected light, but trusting only upon the Holy Spirit, who is ever the same, shining forever and testifying to the individual and the priesthood, who live in harmony with the laws of the gospel, of the glory and the will of the Father. They will then have light everlasting which cannot be obscured. By its shining in their lives, they shall cause others to glorify God; and by their well-doing put to silence the ignorance of foolish men, and show forth the praises of him who hath called them out of darkness into his marvelous light." A body that is full of light will shine directly and powerfully, not needing to reflect the light of others. As President Smith notes, one of the great blessings of this shining light is that others will see it and glorify God. It will also help to overcome criticism and foolish ignorance, and will ultimately bring glory to God who is the source of the light. 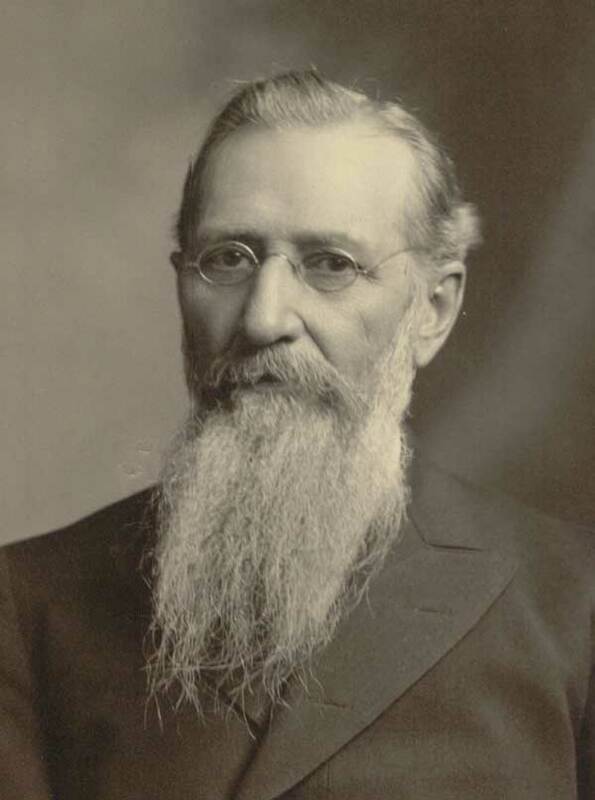 As far as I know, the concept of "borrowed light" originated with Heber C. Kimball who spoke of it several times. 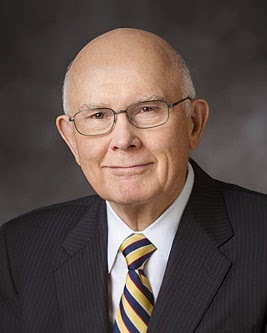 Click here to read an example of his teachings, with an added insight from Robert J. Matthews about our occasional tendency to borrow from our own light. "Leave school with your books and your minds still open, and make your lives a quest for knowledge. Plato thought knowledge the highest human good, and Matthew Arnold thought the primary purpose of education was to help students to see things as they really are, to see the world about them as it really is. Only as we see the world as it really is can we hope to solve its problems. Only by knowledge can we banish ignorance, superstition, prejudice, fear, and hatred, the evils from which spring most of our world's problems. Therefore it is imperative that you continue to seek knowledge." Part of the development of character occurs as we continue to gain knowledge throughout life. President Hunter gives the classic advice, "Leave school with your books and your minds still open." We need to continue to learn new things throughout our lives; and we need to have our minds open to new ideas, different approaches, changed opinions. This is a great key to ongoing success and happiness, individually and collectively: "Only by knowledge can we banish ignorance, superstition, prejudice, fear, and hatred, the evils from which spring most of our world's problems." That is a bold statement, one that we should all put to the test!